I finished sewing the last 8 rows of the plaid half hexie quilt. Now I just need to attach it to the other 12 rows and press the last seam. 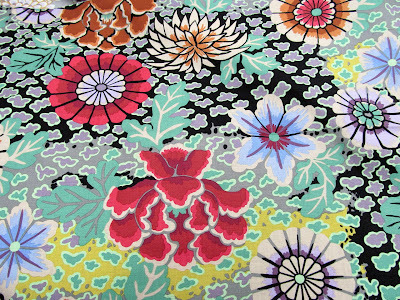 I have enough of both of these Kaffe fabrics for the back of the Stone Log Cabin. I just pulled them out late last night so I'll look at them today in daylight. 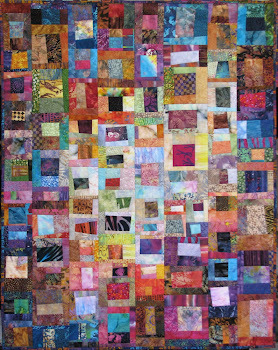 This fabric, the same as the center rectangle and 2 borders is what Kaffe used on his. My friend is going to put it on the back of her quilt. 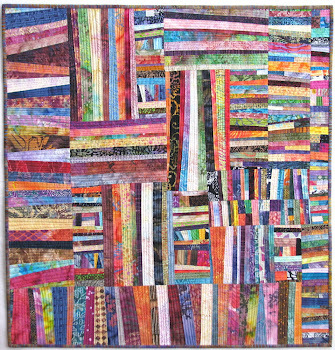 She eliminated the last 2 borders and is putting a wider border of this one as her final border. 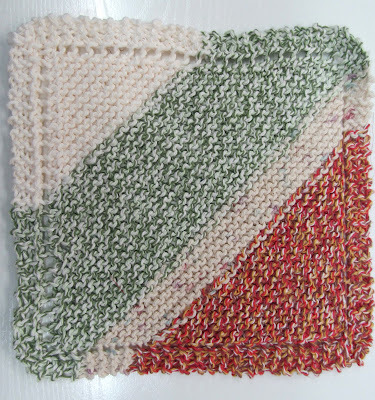 I finished a dishcloth last night that used the ends of 4 balls of yarn. 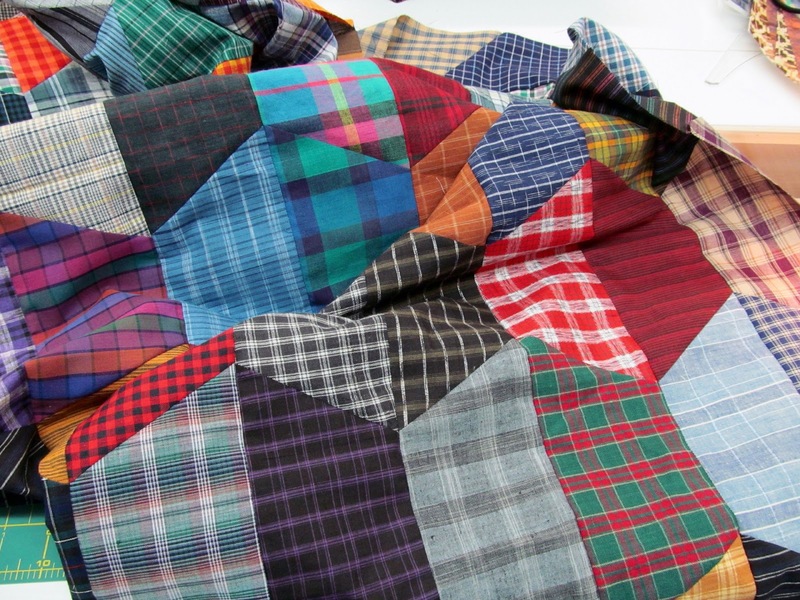 Any one of those fabrics will be perfect for your quilt. Your Fasset fabrics are like none other.. Your scraps of yarn worked well together, it will go in any kitchen nicely. Will we see the half hexes Tomorrow ? 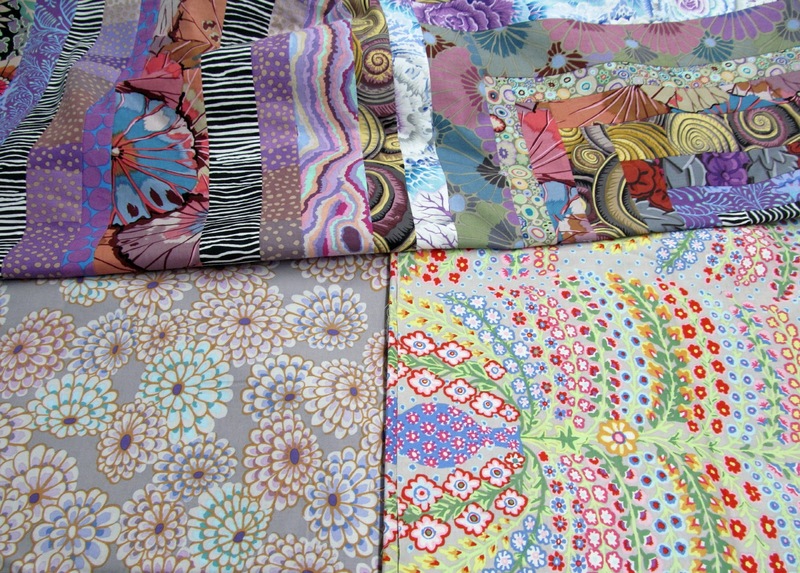 love your background choices.....................I think the one on the left is a perfect "low volume" companion to the vibrant quilt front! The one on the left is a better match, but I like the colorful one on the right. Looks like we are in for some very nasty weather for a couple of days. I had some of the gray on the left and I loved it -- so that would be my choice. But you are there and can see the colors in real time - meaning I know you'll choose the best of the two. I love the dishcloth!! I have tried to make them, but I just cannot do it...not my thing!! May I ask your method for weaving in yarn ends when knitting your dishcloths? I make that same pattern (and another), but weaving in those ends is a bugaboo. They just don't always want to stay completely hidden! I'm another going with the fabric on the left, although I also do like the RH side fabric. 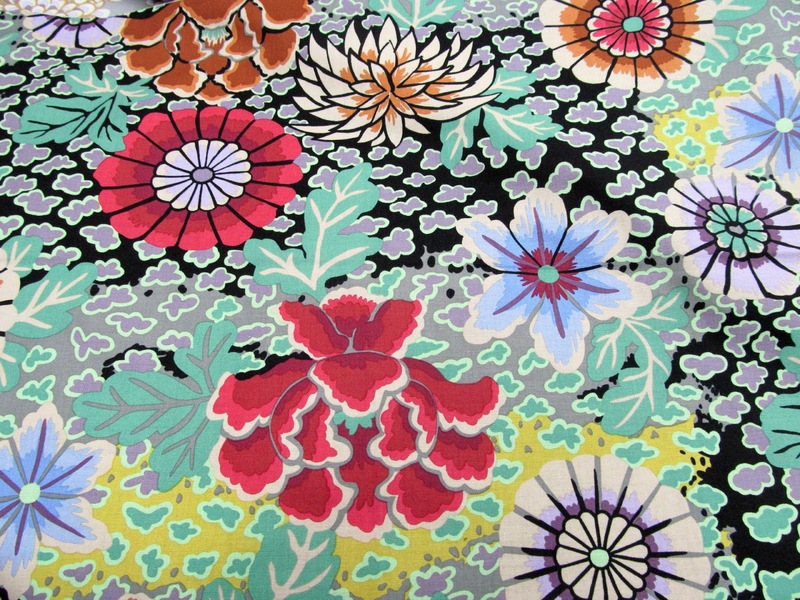 Kaffe's Dream - love this design and every colourway!